The natural flow of the Montessori classroom provides the first direction of order for a child. The materials are positioned on the shelves based on a logical learning sequence. They are arranged and presented to a student beginning with the most concrete and tangible concepts to more abstract and advanced concepts as a way for learning to build on a gradual gradient of acquiring knowledge and skills. This order indirectly helps children to develop sequential work patterns and cycles of activity. With the gradual progression of materials that require more steps to complete and more advanced skills, a child’s higher concentration is developed. The materials are specially designed for children to explore and discover the lesson within. The teacher provides a carefully prepared environment that supports independence in a classroom that is designed for freedom within set guidelines. The classroom is a children’s community where they experience a sense of personal empowerment. All furniture is fit for children and all materials are placed where children are able to reach. The artwork on the walls are even hung lower to be within their view. This child-sized classroom allows children to develop a sense of ownership over their environment, as well as the ability to be less dependent on the adults in the room. They are able to prepare their own snack when they are hungry and help each other clean up when there is a spill. The Practical Life Area is the child’s first introduction into the Montessori classroom. This area allows children the opportunity to practice practical living skills with the purpose of caring for the self, the environment, and others. These materials also help to strengthen and refine children’s fine motor skills and coordination. Activities such as pouring, buttoning, and polishing provide the groundwork for independence, self confidence and the concentration necessary for more advanced areas of the classroom. Grace and courtesy lessons aid with communication and social development while teaching a child respect for himself or herself and others. The Sensorial Area provides a child with the opportunity to stimulate and refine his senses to create a foundation for which the child can better perceive the world. Children explore variations of size, shape, color, smell, texture, sound, and weight, thus becoming more aware of detail. Materials like the Pink Tower and Red Rods introduce students to concepts of math by allowing them to explore two and three dimensional shapes, sequence and progression, differentiation of size and dimension, and internalize concepts of base ten. The Mathematics Area helps children to internalize advanced concepts through hands-on tangible materials that they are able to physically manipulate. Learning numbers is an abstract idea. The Montessori materials, however, teach this in a concrete way through specific materials that isolate concepts. The Red and Blue Rods represent the quantities one through ten. Children then learn the letter symbols through use of the Sandpaper Numeral cards. Children not only see the written number symbol, they can also hold each of the corresponding quantities in their hands. The curriculum spans from lessons on one through ten all the way to operations. The Language Area provides pre-reading, phonics, and handwriting materials that build language and early literacy skills while expanding students' vocabularies. Matching, opposites, and sequencing are a few of the pre-reading works that establish a basis for literacy. 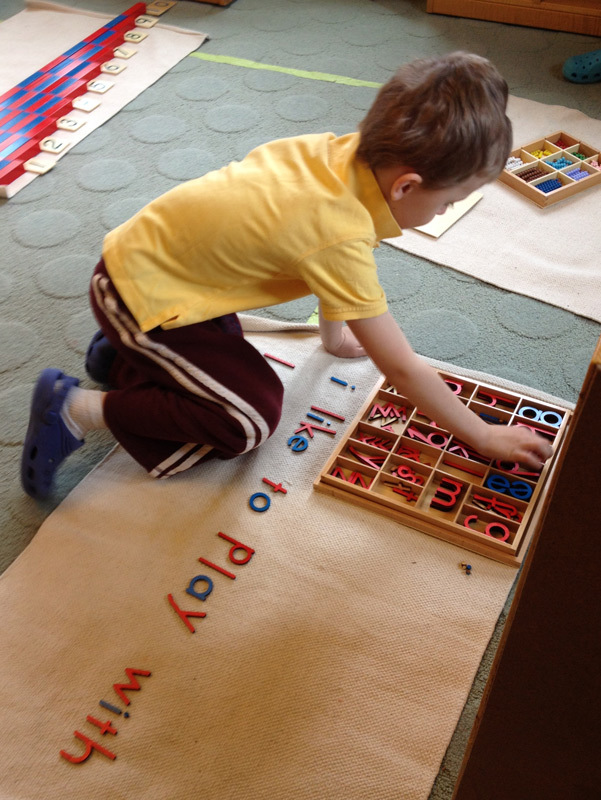 One way that writing and reading is taught is through use of the Sandpaper letters. Children are shown how to trace each letter with two fingers following the same direction in which the symbol is typically written. In this method, children SEE the shape, FEEL the shape, and HEAR the sound of the letter that the teacher is introducing. Reading is taught phonetically as the child is ready, using materials like the sandpaper letters to teach individual letter sounds and move on to using the moveable alphabet to construct words. The Cultural Area integrates Maria Montessori’s vision of world peace into the curriculum. Students are exposed to geography and cultures, including countries, music, animals, time, history, and art. This area also includes opportunities to learn about life sciences, physical sciences, and earth sciences.